South Korea’s three major telecommunication providers, SK Telecom, KT and LG Uplus, will officially deploy the world’s first commercial fifth-generation services here Saturday by sending out the first 5G signals in Korea together. Despite a recent fire at the Ahyeon branch of KT in Seoul, which led to a major network blackout and the cancellation of 5G demo sessions and promotional showcase events this week, the three Korean telcos will commit to their original 5G deployment schedule, they said. For the December launch, the mobile carriers plan to deliver 5G services first by using mobile routers -- devices that enable connection to Wi-Fi devices -- rather than smartphones. 5G services for smartphones will become available in March next year. 5G is a next-generation network designed to be at least 10 times as fast as today’s 4G Long Term Evolution network, promising download speeds of up to 20 gigabits per second and a response time of less than 0.0001 second. 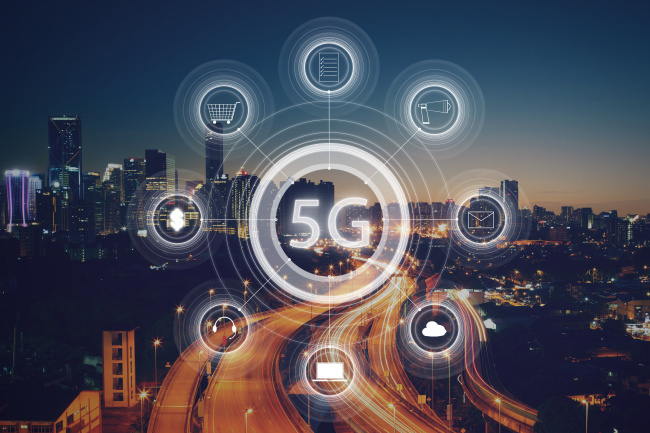 Because 5G can handle large amounts of data with ultra-low latency, it is set to form the basis of many services requiring seamless connectivity, without lags, among humans and objects. SK Telecom plans to deploy 5G services in the Seoul metropolitan area as well as Korea’s six major cities: Busan, Incheon, Daegu, Daejeon, Ulsan and Gwangju, with the network becoming available first to corporate clients in the manufacturing sector. The mobile carrier’s first 5G client is Myunghwa Ind., an automobile component manufacturer, which will adopt SKT’s 5G-AI machine vision solution that will collect and send high-definition photos from the production line to a cloud server, where they will be judged for defects via artificially intelligent algorithms. To maximize security, SKT also plans to first deploy its quantum cryptography system in the Seoul-Ansan area, and later apply the technology to clients’ servers. The firm also boasts an AI network technology that ensures speedy data transmission and quality maintenance, it said. “5G is the central vein connecting people to objects, and objects to other objects in the age of the ‘fourth industrial revolution,’ while AI will become the brain that seeks optimized solutions. It will become the core of SKT’s competitiveness,” SKT CEO Park Jung-ho said in a company-wide message shared Thursday. Likewise, LG Uplus will deploy 5G services in the Seoul metropolitan area and selected major cities in Korea, and start offering 5G network router packages and 5G portable Wi-Fi payment plans. The mobile carrier plans to install more than 7,000 5G network stations across Korea by end-December, and extend its 5G infrastructure to major cities before launching smartphone-enabled 5G services in March next year. KT, which is still reeling from the consequences of the fire that has tarnished the mobile carrier’s reputation and sparked concerns over network stability, is also looking to continue its stated efforts to deliver stable 5G services here. The company plans to hold an internal event at the KT Intelligent Network Control Center in Gwacheon, Gyeonggi Province, to mark its first-ever commercial 5G deployment. Ahead of this week’s 5G deployment, KT reshuffled and promoted key executives in an effort to strengthen ties and synergy between teams conducting 5G-related services.